This building complex located in the beauty spot Oboke houses rocks and gemstones museum and a tourist information center. In 8th August 2008, Rest Area Oboke was newly opened after being authorized as 14th in Tokushima by Ministry of Land, Infrastructure and Transport. Next to the museum, which exhibits rocks and gemstones not only from this area but around the world, is a cafe with terrace seating, a souvenirs shop and a foot bath (Saturday, Sunday and National holiday only). 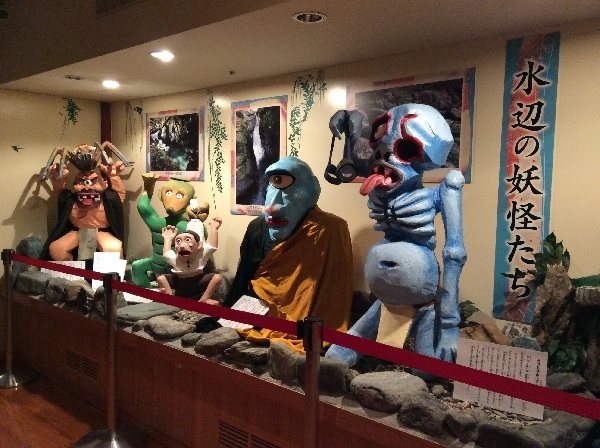 Here is also the permanent exhibition room displaying models of hobgoblins, for it is believed this area is the home town of “Konaki-Jijii”, who appeared in the comic book “Ge-Ge-Ge-no-Kitaro”. You may request a volunteer guide for the trails or experience accessory craft-making (reservations necessary for groups). For more information, please ask at the Tourist Information Center. *2 car spaces for the handicapped. Get off at Ikawa-Ikeda IC→Take the National route 32 bound for Kochi→Rest Area Oboke and Lapis Oboke（Journey time is approx. 35 minutes by car.） Get off at JR Oboke St.→20 minutes walk or 5 minutes by car to the destination.